ALEPPO, SYRIA – Alfan Ghanim had heard that the Americans were coming and she wanted to be ready to state her case. Since fleeing Iraq nearly two years ago for Aleppo, Syria’s second largest city, Ghanim has been clinging desperately to her dream of emigrating to the United States with her husband and two young sons. 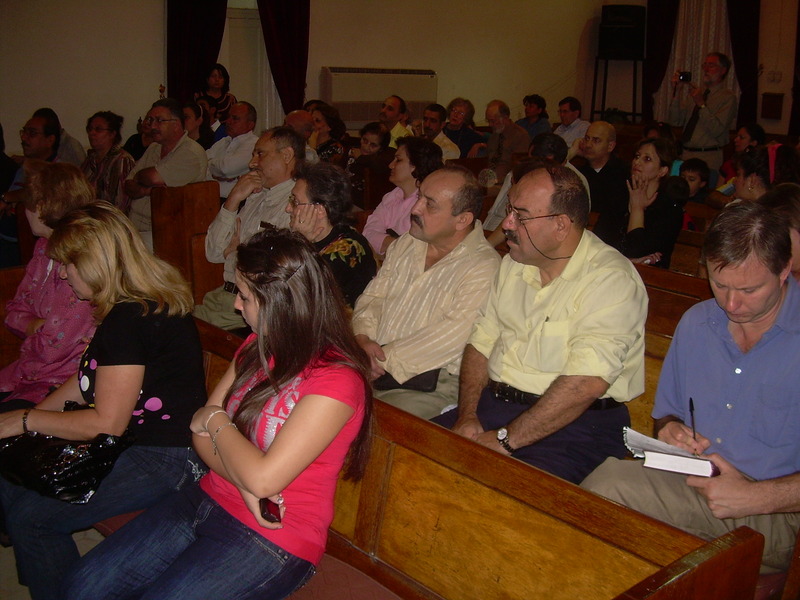 After hearing that a group of American Presbyterians were coming to visit the National Evangelical (Presbyterian) Church of Aleppo, where she and her family often go to worship, Ghanim arrived armed with copies of various documents in the hope that the American visitors might be able and willing to help. The Americans Ghanim was hoping to meet were members of various Presbyterian Church (USA) congregations who had arrived in Damascus, Syria on October 4 to participate in a four-day meeting with a delegation of church leaders from the five Presbyterian churches in Iraq. At the end of the gathering, more than a dozen members of the twenty-two strong American delegation traveled to various towns and cities in Syria, where they met with local Presbyterians and visited a number of Evangelical (Presbyterian) churches and schools. Aleppo, Syria’s second largest city, is a poor, dusty place, and American visitors are, at best, a rather peculiar novelty. The American Presbyterians arrived bright and early on October 12 for the regular Sunday service at the Aleppo church, where the unscheduled encounter with the Iraqi Christian refugees took place. As the service began, some forty to fifty Iraqi refugees filled the pews, immediately doubling the number of regular worshippers. One Iraqi woman, who was already weeping, immediately approached PC (USA) General Assembly Council staffer Amgad Beblawi. “We are respectable people and look at what has happened to us,” she said through her tears. Following the service, church members and their American guests gathered, the way most American congregations do, for coffee and tea in the church’s modest, stone-walled fellowship hall. As the Americans were preparing to leave, however, the Iraqis repeatedly asked to be allowed to tell their stories. The Iraqis and their visitors returned to the sanctuary, where a highly charged atmosphere of desperation immedately filled the air. On the Iraqi side at least, it appeared that everyone wanted to speak at once. Acting as an unofficial spokesman, a middle-aged Iraqi man took the microphone. “It was difficult during Saddam’s time,” he said, “but at least we had dignity and honor.” Like most of the refugees, the man asked that his name not be used out of fear of reprisals. Mny of the Americans said that the impromptu meeting was more unsettling than any other meeting they’d had during their travels. Afterwards, Dora McComa of Great Falls, Montana, one of the Americans on the trip, said she was surprised by the encounter. “I hadn’t expected anything like that at all,” she said. Rev. Raafat Zaki of Atlanta, who was traveling with the American group, said that the Iraqi refugees needed counseling to help them cope with their predicament. He also said the church and its pastor, Rev. Ibrahim Nisir, appeared “overwhelmed and drained” by the presence of the refugees. Alfan Ghanim’s story was only one of many. Alfan Ghanim had brought a document from the United Nations High Commission on Refugees confirming her status as a refugee, along with a letter from her supervisor praising her work as a translator for the American troops and recommending that she and her family be allowed to emigrate to the United States. Ghanim said she began working for the American military after Islamic militias told her she had to wear the hijab, the traditional Islamic dress for women, or quit her job as a pharmacist. She quit, but soon feared that her new job with the American military was putting her life and those of her two young sons at risk. After one son was injured by an improvised explosive device (IED) in what Ghanim felt was a deliberate attack, the family fled the troubled city of Mosul for Syria. Hassan Jibrail Boulos told the Americans that at one time he had held an important position in Iraq, but that since coming to Aleppo two years ago he and his family have been living in almost unbearable conditions. “We are living eight of us in a two-bedroom apartment,” Boulos said. Like many other Iraqi refugees, Boulos said he is being forced to use his life savings to pay for housing and basic necessities. Also, that same Sunday, two Christian homes were bombed in Mosul, killing five and causing yet another wave of Christians refugees to begin pouring into Syria. According to the Rev. Nuhad Tomeh, the Presbyterian Church (USA)’s regional liaison for Syria, Lebanon, Kuwait and Iraq, after the attacks five Christian families arrived in Aleppo “with only the clothes on their backs.” Later, Tomeh said the Middle East Council of Churches estimates that since Sunday approximately 1,200 families have fled the Mosul area. The majority are internal refugees, Tomeh noted, who are staying in monasteries and churches in several Christian villages northeast of Mosul in the Ninevah Plain, although some may eventually end up going to Syria or to another country that might be willing to accept them. Since 2003, approximately 1.25 million Iraqis have taken refuge in Syria while another 75,000 have fled to neighboring Lebanon. Of the Iraqi refugees in Syria, some 40,000 are Christians, while in Lebanon the number of Iraqi Christian refugees is said to total approximately 10,000. “The Iraqi police and army are taking the situation very seriously,” Tomeh said, “and are working very hard to find the perpetrators” (of the attacks.) But many Iraqi Christians insist that their government is covering up the extent of the persecution while also giving false assurances that security has been improved. Following the emotional encounter in Aleppo, Tomeh, who was accompanying the Americans on their trip, said that the Iraqi Christian refugees in Aleppo have said they no longer wish to meet with groups from the U.S. because of what they view as the Americans’ inability or unwillingness to help them. Nevertheless, despite this bitter vow, the Iraqis came on this particular Sunday, some clutching official papers while others were holding onto nothing more than an invisible strand of hope. Many of the Iraqis at the church in Aleppo said they believe the attacks are being perpetrated by radical Islamic or Kurdish groups intent on driving Christians out of the Mosul area and even out of Iraq altogether. The Americans listened sympathetically, and several offered to take copies of the Iraqis’ documents with them. Others said they would make phone calls or write letters on the refugees’ behalf once they returned home. Later, however, several members of the American delegation said they doubted whether they would be able to do anything truly constructive. 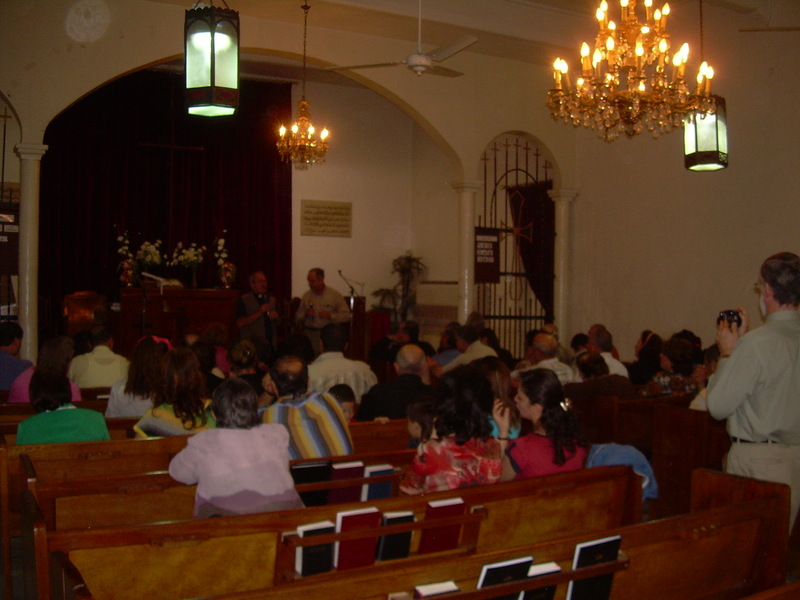 The National Evangelical (Presbyterian) Church in Damascus is also bracing for a similar influx of Iraqi refugees. The church’s pastor, Rev. Boutros Zaour, said he was certain that his church would soon be feeling the effects of the recent violence against Christians in Mosul. “Whenever there is pressure in Iraq that makes for more refugees in Syria,” Zaour said. The Damascus church is already serving at least thirty-five families from Mosul, Baghdad and Basra, Zaour said, adding that many refuges are suffering from depression and other psychological problems. Zaour was quick to concede that the Iraqi Christian refugees are stretching the church’s limited financial resources to the breaking point.